The idea of bringing our information anywhere popularized by smartphones offer features that give us access to a myriad of services in order to have everything within reach. But now called wearables have entered the stage looking to transfer that experience to other devices. Thus emerged watches, bracelets, rings and other items that we want to have at hand information from our smartphone, but a bracelet that is capable of projecting the image of the mobile screen on our arm and also to interact with it? It is the first time and that’s what gives Cicret Bracelet. 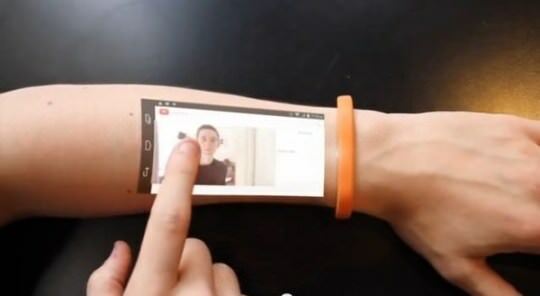 The idea of this bracelet is very similar to that offered the Ritot clock, but here was only the projection on the skin without being able to interact, what Cicret offers is that we can use our skin to have access to the screen of our Android smartphone without having to remove the mobile through a pico projector. The bracelet is connected to the Android device, no matter whether smartphone or tablet via Bluetooth and thanks to eight proximity sensors is as it can be detected by our movements and so perform functions as if the screen of the mobile front to us, where we can answer or make calls to play and answer emails. Its creators have not given much information about the technical specifications, have only mentioning that the battery is long lasting because while it is idle consumption is minimal, and to make a move on the wrist is how it turns the spotlight besides that bracelet is waterproof, which will make it durable and can be used in various situations, but would have to see their performance in full sun ray. The curious thing about this project and what makes many people doubt its veracity, it is a project of crowdfunding that is not hosted on any of the platforms designed for this purpose, but funding is sought donations through PayPal from product page where you can donate from a euro in order to reach a goal of 700,000 euro to complete the development of the bracelet and other 300,000 euros to develop the application that will connect to the smartphone. Of course it’s a great idea and the project is attractive, but the lack of accuracy has effectively raised so far only 14% of the goal, where at this rate it looks complicated that they can get it. 8K TVs arrive, are they really necessary?